Unlock the power of the unfocussed mind. 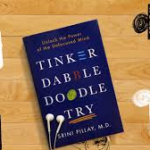 That is the subtitle of Dr. Srini Pillay’s book, Tinker, Dabble, Doodle, Try. And it is what attracted me right away to buy the book. Have you ever experienced difficulty staying focused? Or have you ever been so focused on something that time passes and you suddenly realize that you have been focused on one thing for hours? I seem to experience both frequently; the latter often when I am at the computer. Our culture is very pro-focus. We learn it in school (I can still hear my Grade 5 teacher rapping her ruler on the desk and saying “Focus, students, focus!!”). Our jobs demand it. Whether you are a dentist in the middle of a big case, or the CDA assisting, staying tuned in to the task at hand is mandatory and necessary. One of the parts of working at the front desk that I found so annoying and difficult is the constant pull away from focus by phones ringing. Even our leisure time is often centred on being focussed, keeping our ‘heads in the game’. Dr. Pillay’s thesis is that we are too focussed! As a Harvard-trained psychiatrist and brain researcher, his credentials lend credibility to his hypothesis that our brains are not hard wired to stay focussed for long periods of time on one thing. He claims that when we switch off the focus and allow our thoughts to wander and imagine, we not only release our creativity and enable it to flourish; we can return to focus refreshed and with greater ability to focus! Wow! As I delve deeper into his book, the ideas that he advocates are resonating with me. By training myself to be able to switch easily from focus to unfocus and back again, I am nourishing both and will be better at both! I love that. I will likely write again about Tinker, Dabble, Doodle, Try. For now……I am enjoying the journey. PreviousPrevious post:Failure to Launch?NextNext post:Are you too nice? If It’s Not Working, Change It! What are you telling your patients?